If you haven’t heard of Fictiorama Studios yet then I don’t blame you. They are a very discreet and hard working literal band of brothers based in Madrid, who’s debut adventure game Dead Synchronicity has just been successfully funded via Kickstarter. If you’ve played their already released demo (found here) you’ll notice a unique art style coupled with an old school adventure feel and a dark, gritty and modernised story. Delving deeper into their official website things start getting interesting. It’s here where you’ll find their developer blog, portions of which dissect a whole range of classic and modern adventure games, bullet pointing the best bits and showing where some of the inspiration for their development of Dead Synchronicity has come from. On top of this the site also reveals that Kovalski, the band behind all of Dead Synchronicity’s music contains two of the very same brothers from Fictiorama. The passion behind this small team is almost immeasurable and I recently had some of their drive directed my way when I was lucky enough to ask them a few questions. Kevin McLennan – Some of our readers might not have heard of you, is this your first game? Fictiorama Studios – Yes, this is our first game! 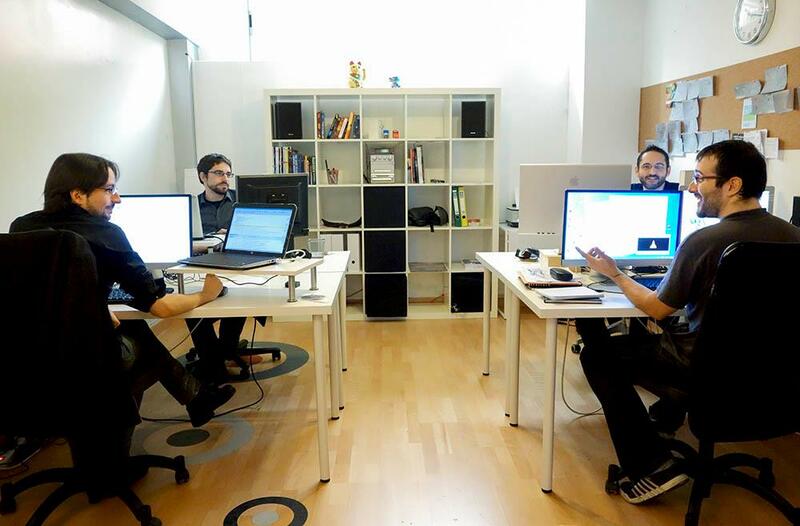 Some of the members of Fictiorama have previously worked in video games and iOS apps, and others come from different artistic areas (music and media). We are really excited! Kevin – So where does the name Fictiorama Studios come from? Fictiorama – Our goal was to get a name for the studio that sounded like entertainment and fantasy. So we started with “fiction”, and then the Greek suffix “horama”, which means “view” (such as in “cinerama”, the spectacular 3-cameras process from the 70’s). In fact, “Fictiorama” reminds us of some mysterious storytelling device you turn to when you are in need of amusement. We really like it! Kevin – Give us a run down of what Dead Synchronicity is all about. Fictiorama – Dead Synchronicity: Tomorrow comes Today is the first instalment of the Dead Synchronicity series, a 2D point and click graphic adventure game featuring “old school” mechanics and a mature, bloodstained plot. The game takes place in a world that has been devastated by “The Great Wave”, an inexplicable chain of natural disasters. Besides, there’s a pandemic spreading all over the world: the “dissolved” illness that, although gives sick people strange cognitive powers… finally kills them, dissolving them into blood. Michael, the main character, wakes up to this merry “New World” after having been in a kind of a coma that has wiped his memory. He must try to recover his identity, find the origin of “the Great Wave” and a cure for the “dissolved” pandemic, as both things seem to be connected. Kevin – Where do the ideas and inspiration behind Dead Synchronicity come from? On the other hand, we love dark, psychological plots, like those in works by Joseph Conrad or Andrei Tarkovski. In fact, one of our biggest influences is Cormac McCarthys “The Road”: we really like the depiction of the post-apocalyptic scenario, since it is is used as a metaphor both for the “physical” degradation of the world… and for the “moral” degradation of the new society. Regarding mechanics, our biggest influences are the classic point and click adventures by Lucasarts… though featuring a mature twist; games like I have no mouth and I must scream or The Cat Lady are clear references for us. The team seem surprisingly happy for working in such an enclosed space. It must be Friday. Kevin – It’s clear that the team at Fictiorama are passionate about creating Dead Synchronicity. As a small indie company have you found it a struggle producing your first game? Fictiorama – To be honest, the biggest difficulty we have faced is getting funds. In Spain, it’s quite difficult to get funds for such a project like ours. So, we had to fight hard to get the funds we needed to launch the studios and start developing the game. Of course there are day to day issues a studio has to deal with… that are of bigger importance when you are as tiny as we are. But we all are really engaged to our project, and we deal with them as challenges to overcome (ok, let’s even say “achievements” using gamers jargon). Kevin – Aside from core gameplay development and mechanics, your four man team also create the unique music and art stylings for Dead Synchonicity. Are you scared to let anyone else have input in your game or are you all naturally artistic and hard working? Fictiorama – Well, as we work on a budget (we are not a AAA company) we have always tried to keep expenses under control. That’s why we decided we needed to form a multidisciplinary crew: art, music, writing, media, programming… in a tiny team. In fact, thanks to the Kickstarter campaign, we will probably count on a second artist’s collaboration for a few months. But we really love to have input. In fact, from the very beginning we have been sharing with the community the progress of Dead Synchronicity: the music, the art, our influences… Some great ideas come from that feedback all the time! Kevin – You recently funded a successful Kickstarter campaign. What does this injection of money mean for the company and the game? Fictiorama – The funds we got on Kickstarter will allow us to finish the game! We initially had some funds to launch the company, to start the project… but we needed some extra funds to finish the game. So, it essentially means we can now release Dead Synchronicity: Tomorrow comes Today! Kevin – Is there an estimated release date for the game? Our goal is to release PC & Mac versions in December 2014 and the Linux and iPad versions in 2015. Fingers crossed! The Reticule would like to thank the team at Fictiorama Studios for taking the time to answer our many questions.